How do I backup my Circuit locally? 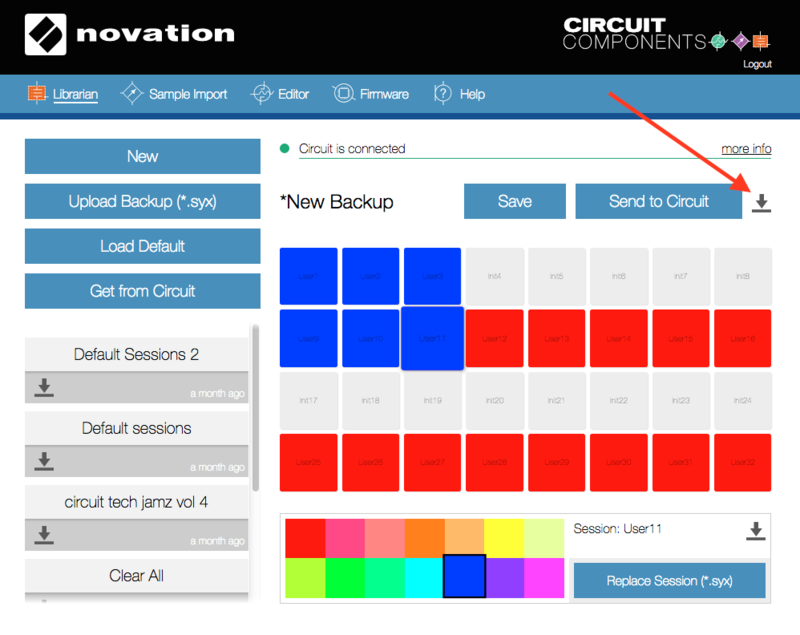 With the latest updates to Circuit Components, you can now download individual sessions from your sessions page as well as your samples sets. Download the .syx file. Hold down the Scales, Note & Velocity then power the unit on. This will access the Bootloader. Open SysEx Librarian and drag the .syx file into the SysEx Librarian window. Click on the 'Destination' menu and select 'Circuit'. Ensure that the .sys file is highlighted in blue by clicking on it. Click on the 'Play' button. The Circuit should display the updating leds. Wait for the update to complete then power cycle your unit. Open MIDI-OX, click on the the 'Options' menu and select 'MIDI Devices'. Ensure that 'Circuit' is highlighted in the 'MIDI Output' section then click 'OK'. Drag the .syx file into the MIDI-OX window. The 'SysEx View and Scratchpad' window should appear. Click on the 'Command Window' menu and select 'Send Sysex'. *Bear in mind when loading individual sessions they will always load into Slot 1 (top left corner pad). You would want to leave this pad open when loading sessions. You can then duplicate the session you load to another slot, and continue to load sessions. Importing single sessions via Sysex in to Circuit.